The terrestrial cyanobacterium Nostoc sp. HK-01 was more tolerant to NaCl stress than the aquatic cyanobacterium Anabaena sp. PCC 7120 (also called Nostoc sp. PCC 7120) which is similar to Nostoc sp. HK-01 in phylogeny. We determined the amount of extracellular polysaccharides (capsular and released polysaccharides) from the cells of both strains cultured with or without 200 mM NaCl. The amount of capsular polysaccharides from Nostoc HK-01 reached approximately 65% of the dry weight whereas that from Anabaena PCC 7120 only occupied approximately 18% of the dry weight under NaCl stress. Anabaena PCC 7120 grew well under NaCl stress when both polysaccharides from Nostoc HK-01 were added to the culture. However, Anabaena PCC 7120 barely grew under NaCl stress when both of its polysaccharides were added. Extracellular polysaccharides from Nostoc HK-01 contained abundant fucose and glucuronic acid in comparison with those from Anabaena PCC 7120. Under NaCl stress, the composition ratios of sugars in the extracellular polysaccharides from Anabaena PCC 7120 hardly changed in comparison with those in ordinary culture conditions. By contrast, the composition ratios of sugars in the extracellular polysaccharides from Nostoc HK-01 changed under NaCl stress. 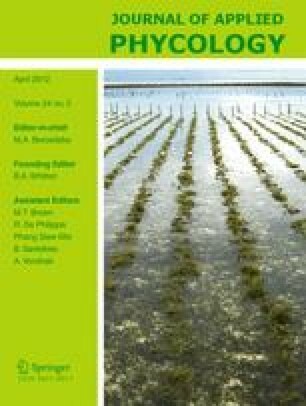 These results suggest that the effect of extracellular polysaccharides from Nostoc HK-01 on NaCl tolerance comes from the increased amount of capsular polysaccharides, the sugar composition, and the change of the sugar composition ratio under NaCl stress. This work was supported by a Grant-in-Aid from the Ministry of Education, Culture, Sports, Science and Technology (18651013) and the Japan Space Forum.